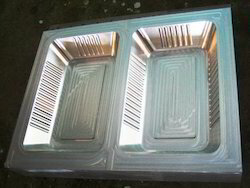 As per the increasing demands of the customers, we are involved in offering best quality of Thermoforming Mould. The offered Thermoforming Mould is extensively used for PP and HIPS disposable containers and for thermoforming machines to create disposable containers, glasses, cups, trays, containers etc. Looking for Thermoformed Plastic Tray Mould ?